Summer here in France begins with the sound of music. The 21st June marks the date not only of the first day of summer but, more importantly, of the public celebration of music and arts that is the Fête de la Musique. Launched in 1982 by the then Minister for Culture in order to promote music for everyone, it has become a much loved and celebrated festival all over France and has also spread to hundreds of other countries around the world. On the 21st June from midday to midnight, just about every town in France will have some sort of event or concert taking place and all genres of music on the streets, in the squares, in public buildings, parks, stations and castles along with, of course, plenty of good food, wine and merrymaking. 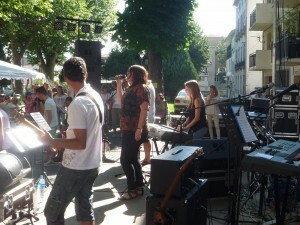 The department of the Ministry of Culture in charge of promoting the Fête de la Musique requires that all concerts must be free to the public, that all performers donate their time for free and that it be open to any musician, amateur or professional, who want to perform in it (hence the quality of the music on offer can vary hugely!) The aim of the Fête is to attract as large an audience as possible and to popularise every kind of music from classical to rock, jazz to fusion, latino to choral, for everyone of all ages and from all backgrounds. Furthermore, the Fête de la Musique is a way to encourage the major music institutions (orchestras, operas, choirs, music schools) to perform outside their usual location and to develop exchanges between city centres and their outlying areas, to offer concerts in hospitals or in prisons, to promote encounters and exchanges between young musicians and well-known talents and to encourage a love of music of every and any kind. 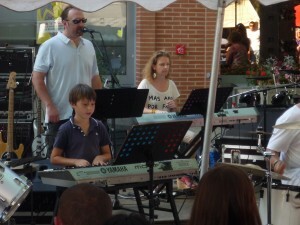 These photos are from the St Girons Fête de la Musique 2015; a fantastic evening with a great atmosphere (and very talented young musicians but I might be biased here!) The weather was perfect, café and restaurant terraces were full to bursting and there were an eclectic mix of bands and music to suit every taste; summer feels as if it has well and truly arrived.